Oh to have more time to write this blog. Today, however, I’m going to put all other tasks aside to share my thoughts about our fantastic 9th Annual Working 2 Walk Symposium. Each year I come away overwhelmed with impressions, emotions, and ideas, and 2014 was no different. But this year the sum of my feelings was decidedly more positive and optimistic than in the past. Secondly, we had our highest number ever of registered attendees, and of those our highest percentage of people living with paralysis. Collectively they brought an extraordinary level of enthusiasm, knowledge, and forward-looking energy to the proceedings. The Advocacy Breakout session lasted well into the evening, and the discussion continues today. 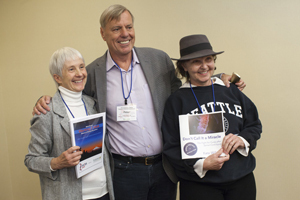 Marilyn Smith, Peter Wilderotter, and Kate Willette announce the launch of Kate’s new book. 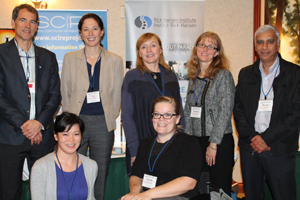 The Rick Hansen Institute sends a team of scientists & advocates to the Symposium. Ida Cahill talks with advocates after announcing Conquer Paralysis Now’s SCI Challenge. Our absolutely amazing emcee, Barry Long from Pushing Boundaries. What really sticks in my mind, though, is the sense of unity and common purpose that developed over the course of two days. Stakeholders from across the spinal cord injury spectrum came together with open hearts and inquiring minds, and spoke honestly and respectfully of their goals & challenges, strengths & weaknesses, as they renewed their commitment to fight for a future without paralysis. As Unite 2 Fight Paralysis enters its 10th year of existence, it finally feels like we are starting to live up to our name. U2FP was built from the bottom up, created from the heart and strengthened by the blood and sweat of those who live the life; it has taken a while to gain credibility. After this year’s Symposium, I have renewed faith that together, united, we can win the fight.